Pleasure: A gay club in Belgrade embraces Serbia’s local pop music in all of its macho, misogynistic glory. A gay club in Belgrade embraces Serbia’s local pop music in all of its macho, misogynistic glory. Pleasure’s interior seems purposely designed to resemble any other mass-market Belgrade nightclub. BELGRADE, Serbia—As my friend leads me toward the entrance to Pleasure, I realize that I have unwittingly passed it countless times before. Situated on one of central Belgrade’s main thoroughfares, my favorite takeaway restaurant sits just around the corner, and we’re within spitting distance of Serbia’s national assembly. Throughout the week, the path to the club’s doors is usually shuttered off from the street by a heavy gate, and even now it looks like nothing more than an inconspicuous loading bay servicing the adjoining shops. A faded, black-and-pink illuminated sign bearing its name hangs overhead, but the surroundings are so unassuming that I had never bothered to look up, and even if I had, I probably would’ve shrugged it off as a cheap nail salon. This sort of discretion is appropriate for one of the few gay clubs open for business in a country where the LGBTQ population lives under constant threat of repression. Although state-sanctioned discrimination isn’t written into Third Reich–esque legislation like it is in Russia, in real terms, Serbia is a terrible place to live if your sexuality does not adhere to strict heterosexual norms. Statistics cited on national television state that 62 percent of Serbia’s populace considers homosexuality a disease while two of three attempts at staging a gay pride parade in the capital since 2001 have ended in bloodshed and violent clashes between police and rampaging thugs. The most recent attempt at a pride parade, in 2014, was the first that went ahead without major incident, but that shouldn’t be mistaken for a growing sense of tolerance among the local citizenry: Thanks to the country’s European Union aspirations, Serbia’s politicians are being forced to protect minority rights and kept the peace by drafting a 7,000-strong force of riot police capable of fending off Godzilla. With the center of the city on complete lockdown, a small, mild-mannered parade strolled through apocalyptically empty streets. So it comes as little surprise that Pleasure’s facade gives away nothing of what goes on inside, and even during the club’s peak hours on Saturday night, the only thing likely to attract the attention of unsuspecting passers-by is the police van that sits parked out front in anticipation of any trouble. This invisibility is a fitting allegory for the way that many of the club’s clientele live their lives. Despite the rampant homophobia of its environment, Pleasure’s mere existence isn’t what makes it noteworthy. 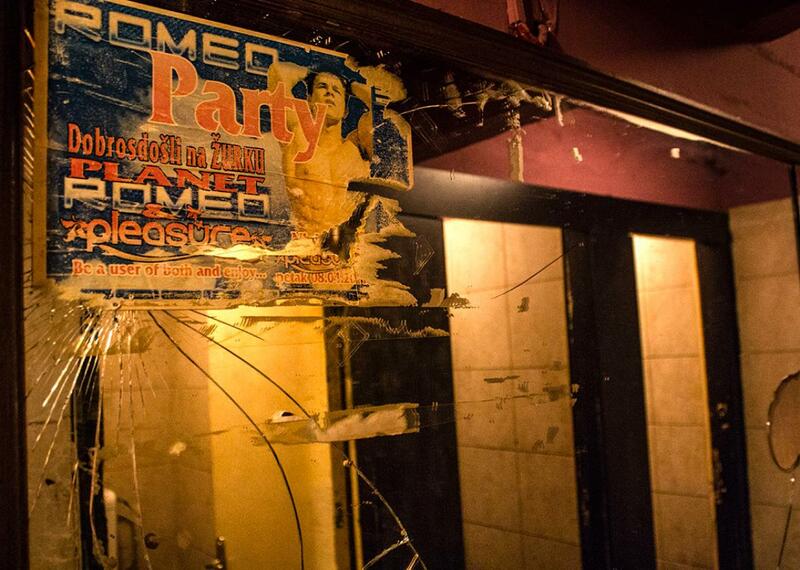 There are other gay clubs in Belgrade, and, although discrete, their presence is hardly secret. What sets Pleasure apart from the rest of them is its stylistic approach. Unlike other gay clubs, which tend to mimic their counterparts in major Western cities (at least as much as their austere finances will allow), Pleasure offers a distinctly Serbian nightlife experience: With its tacky white faux-leather sofas and cheap damask wallpaper, it looks like any other tasteless, mass-market Belgrade nightclub, albeit much shabbier. The musical offerings, meanwhile, consist overwhelmingly of turbofolk. In case you’re unfamiliar with the term, turbofolk is Balkan folk music on steroids. Rooted in the Turkish folk that the region inherited from centuries of Ottoman rule, it takes the strings, rhythms, and wailing vocals common to what can be broadly pigeonholed as “Middle Eastern” music, blends them with the accordions and brass instruments that are so popular across the Balkans, then overlays that concoction onto the cheesiest synthesizer beats and Auto-Tune imaginable. Lyrical content is heavily reliant on love ballads and the sort of gaudy materialism common to commercial hip-hop, and turbofolk performers take their visual cues from the pompous theatrics of Eurovision, although their interpretation is much skimpier, with a particular onus placed on lip fillers and breast implants. This is what passes for pop music in the Balkans, and it enjoys a level of popularity that global stars could never rival, but it’s also representative of the very worst misogyny, chauvinism, and new money tastelessness that Serbia (and the region) has to offer. It’s what you’ll find on the iPods of nationalists, homophobes, genocide apologists, and the hateful strata of society that makes no room for the kind of people that frequent Pleasure. I had always assumed that all of this would make turbofolk repugnant to gay Serbs in the same way that it offends my own liberal sensitivities, but speaking to a friend of mine, a Pleasure regular, it appears that that the reality is more complicated. This pursuit of integration was a recurring theme in my conversations with Pleasure-goers, as it offers a fleeting escape from the segregated confines of their sexuality. Going to Pleasure becomes a sort of role-play, one where you’re no longer marked as “other” and get to live out a normative fantasy. Pleasure offers a distinctly Serbian nightlife experience. I arrive at Pleasure just past midnight (early, by Belgrade standards) and take a spot by the U-shaped bar that sits at the nucleus of the club’s dance floor. It’s only sparsely filled, and patrons sit in self-segregated groups. On the edge of the dance floor that faces the entrance, there are clusters of high-top tables and bar stools, where outwardly masculine (or “straight-acting,” as some would say) men sit in solemn restraint, observing some of their campier counterparts throwing moves on the dance floor from the corner of their eyes. 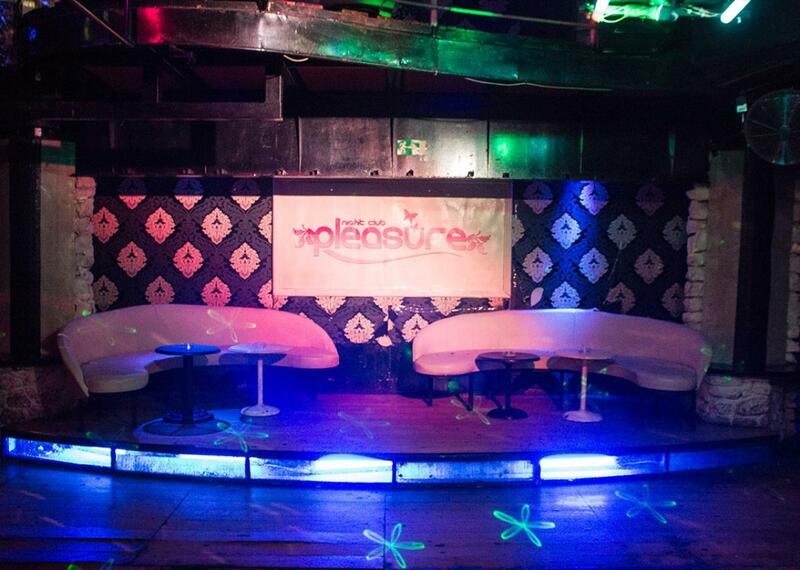 On the far side of the club, there’s a mezzanine area furnished with sofas that looks out across the dance floor. Here, the clientele is pretty much exclusively female. My friend, a regular who has accompanied me, tells me that this is where lesbians hang out. The area is filled with women sporting boyish haircuts, baggy jeans, and loose-fitting polo shirts. I cast regular glances in their direction throughout the night, but few of them filter out to other parts of the club, seemingly keen to keep themselves, isolated from the rest of the predominantly male crowd. An elevated gangway wraps around the inside circumference of the club, hanging above the dance floor. The women I see here and near the bar fit a more traditional vision of femininity, and I assume many are heterosexual. Aside from providing shelter for Belgrade’s LGBTQ population, Pleasure also offers straight women a respite from the overbearing machismo of the local patriarchy. There’s a curious paradox at play in turbofolk. Watch any video by the likes of Jelena Karleusa or Ana Nikolic, or go to any Belgrade club, and you’ll see a procession of flesh, silicone-enhanced cleavage, and innuendo, but this shouldn’t be mistaken for sexual emancipation: Sexually and socially, women are expected to be servile and submissive. This sort of outward sexuality is merely cosmetic and one that ultimately serves the male gaze. In Pleasure, however, straight women have a space where they can exhibit their sexuality on their own terms. This wide, accepting embrace can be seen in the varied clientele, which ranges from a guy with thick-rimmed glasses wearing his hair in a topknot who looks like he serves lattes in Brooklyn to a skinhead with his gray cammo trousers tucked into his boots. Another guy I spot standing at the opposite end of the bar from me is wearing a navy blue Adidas cap and a Real Madrid shirt, while a dude who looks like a salsa instructor (golden tan, black shirt unbuttoned to his navel, combined with white jeans, pointy leather shoes, and a ponytail) grinds suggestively next to him. Or maybe it has more to do with circumstance than acceptance: The reality is that the LGBTQ population in Serbia isn’t so much a community as it is a collection of disparate individuals who largely live their lives in secret and sometimes find themselves in the same place. Smartphone apps might facilitate hookups and romances, but there’s no gay quarter like Chelsea in New York or Soho in London where they can congregate, where individuals can openly explore various kinks and niches, and where the whole can develop a clear identity and splinter into subsets. For now, the best they can hope for is a place to go and find a little a pleasure. For deeper reading on Turbofolk and the LGBTQ community in the Balkans, read Eurovicious’ excellent five-part series in the Balkanist.